These disposable non-woven pre-moistened cloth towelettes clean and disinfect environmental hard surfaces and instruments. Effective against a wide range of organisms, including HIV-1 (AIDS virus) and staphylococcus. 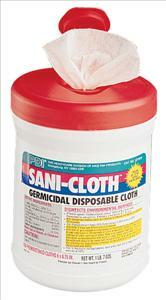 Sani-Cloth Plus features a low alcohol content of 14.85% for general disinfection. Super Sani-Cloth features a 55% alcohol content. Sani-Cloth HB contains no alcohol and is EPA approved to kill Human Hepatitis B Virus. Sani-Cloth Plus, 160 wipes/tub.